WELL ATTENDED: ESVAGT’s stand at WindEnergy in Hamburg attracted a large number of guests and plenty of curiosity. A shared crew: Good cooperation between ESVAGT and its customer maximises uptime and increases operating efficiency in offshore wind farms. 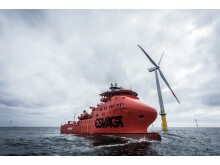 ESVAGT’s unique SOV concept provides efficient and productive operations in offshore wind farms and eliminates many costs.